On March 8th, the Sustainable Harvest® Oaxaca origin office was honored to receive a visit from the U.S Ambassador to Mexico, Anthony Wayne. Ambassador Wayne and other members of the U.S. Embassy staff were in Oaxaca to commemorate International Women's Day and the upcoming launch of the Oaxaca Women's Justice Center. They took time during their trip to visit our office in Oaxaca and to get acquainted with our work in the agricultural sector and our Relationship Coffee Model. 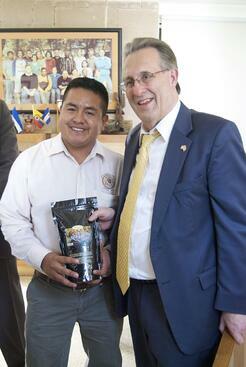 Juvencio Nuñez of the 21 de Septiembre Co-op was present when Ambassador Wayne tasted his coffee. Technology: The Ambassador and his team were eager to learn first-hand about Sustainable´s use of technology-- how we have utilized iPads in rural coffee communities to develop methodologies for tracking farm progress and rating each batch of coffee, and how we have created iPad cupping apps to link and calibrate the cuppers we have trained around the world. Community Impact: One question that came up was how Sustainable measures its impact to the coffee communities in which we work. We shared with them our development work in coffee communities and how we leverage technology and relationships to track and learn from impact. We also discussed how Sustainable Harvest® works with individual cooperatives to make large efforts to educate youth and to make coffee a profitable industry so young people don´t have to leave farms and migrate to cities for work. Quality: Ambassador Wayne and his colleagues recognized the importance of coffee quality in economic success for smallholder farmers. With them, we tasted four different coffees from Mexico´s coffee regions where we work; two from Oaxaca, one from Veracruz, and one from Chiapas. The Ambassador and his team enjoyed playfully arguing which coffee was the best. In the end, they unanimously decided that accolades went to the women-produced lot from 21st of September, a cooperative close by our Oaxaca origin office. Members from the cooperative were also there for the Ambassador´s visit and were pleased to hear the Ambassador proclaim that their coffee was the smoothest on the table. Acknowledgments: Thank you to Laura Harrison for reporting and contributing to this piece.